Roadmarks (1979) is a fragmented, experimental type of novel, tied together by a Road (with a capital R) that leads to all times and places and alternative timestreams in our world’s history, for those who know how to navigate it (a certain German named Adolph briefly pops up in an early chapter, eternally searching for the timeline where he won). The other constant is the character of Red Dorakeen, who has been traveling the Road for years, trying to find something, or somewhen. Sometimes he’s in company with Leila, a woman with precognitive talents. He’s also generally accompanied by one of two sentient AIs in the form of books, called Leaves (of Grass) and Flowers (of Evil). In what frankly struck me as a rather gimmicky move by Roger Zelazny, the chapters of Roadmarks are all titled either One or Two; the first chapter is called “Two” and they alternate from there. The One chapters are linear and relate Red’s ongoing adventures. The Twos, about his would-be assassins and other characters that Red meets up with on the Road, are nonlinear and almost completely random. Zelazny told the story that he put all of the Two chapters on pieces of paper, shuffled them up and simply inserted them into his draft of the book in that order, although he admitted that his publisher eventually convinced him to put at least a few of these chapters in an order that made a little more sense. 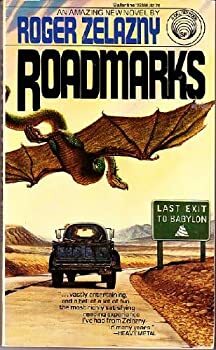 Like the other two experimental novels I’ve read by Zelazny in recent months, A Night in the Lonesome October and Doorways in the Sand, Roadmarks is essentially one big mental puzzle, where Zelazny is hiding the ball from the reader on exactly what’s going on until you get quite deep into the novel. To get any real enjoyment out of these quirky and rather humorous novels, you just have to be on board with that approach and roll with it. For Roadmarks I had an entire page of notes that I took on each chapter of the book, just to try to keep all of the players and moving parts straight in my mind. It was definitely a challenging mental exercise! The concept of the time-traveling Road is very much like that in Peter Clines‘s latest book, Paradox Bound; in fact, I think Clines owes Zelazny a rather large tip of the hat. The kaleidoscopic and non-linear nature of Roadmarks can be fairly confusing, though, and in the end I found it not as intrinsically appealing as A Night in the Lonesome October. But the many colorful characters ― both fictional (some, like Doc Savage, borrowed from pulp novels) and historical ― and Zelazny’s sheer inventiveness are impressive. Roadmarks strikes me as the type of novel that may improve greatly on reread, and at less than 200 pages, I’m sure I’ll be tempted to give it another shot sometime. Published in 1979. The Road runs from the unimaginable past to the far future, and those who travel it have access to the turnoffs leading to all times and places–even to the alternate time-streams of histories that never happened. Why the Dragons of Bel’kwinith made the Road–or who they are–no one knows. But the Road has always been there and for those who know how to find it, it always will be! Hmmm… I might give this a try. Tadiana Jones,thanks for the article post.Really thank you! Great. Thank you too! Hope you enjoy (enjoyed?) the book! Great review and yes I read the book and loved it… so much so that I wrote a short story set in the ROADMARKS universe titled “Rock and Road” which was recently published in the anthology, “SHADOWS & REFLECTIONS: Stories From The Worlds of Roger Zelazny” (Edited by Trent Zelazny). We have reviewed 6755 fantasy, science fiction and horror books, audiobooks, magazines, comics, and films.